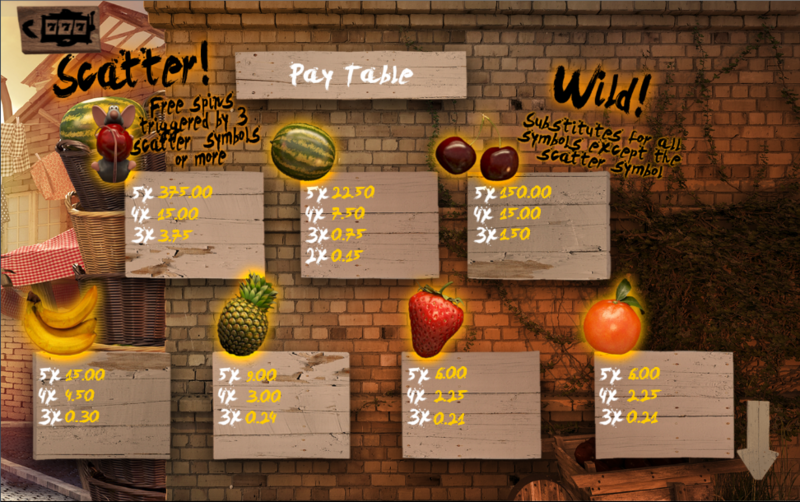 Whether you live in a gigantic metropolis or a tiny village there’s still a place for a market which sells everything you could possibly need at a bargain price; the exact premise behind this online slot from Booming Games is a fruit and veg stall in sunny town – it’s called The Marketplace and you can read all the essential details below. The marketplace is a five reel slot with three rows and up to twenty five paylines; those reels are formed by twenty five separate fruit baskets on a wooden stand, each containing some realistic-looking produce. There are various brick buildings in the background and a shimmering sun in the sky. The symbols are all about fruit as you might imagine and include watermelons, bananas, pineapples, strawberries and oranges. The wild symbol is represented by the cherries and it will substitute for all others except the scatter – that’s a rat holding a cherry and it activates the main feature. This round is triggered by landing three or more of the rat/cherry scatter symbols anywhere in view for which you will receive an initial ten free spins. If you can trigger the round again with three more rats then you will receive ten more spins with a 2x multiplier (level 2); if you can manage it again those next ten spins will be subject to a 3x multiplier (level 3). If you’d like to gamble your most recent win then click the big ‘Gamble’ sign underneath the reels; you now play a double or nothing round in which you must guess if a watermelon or cherry is the right answer. 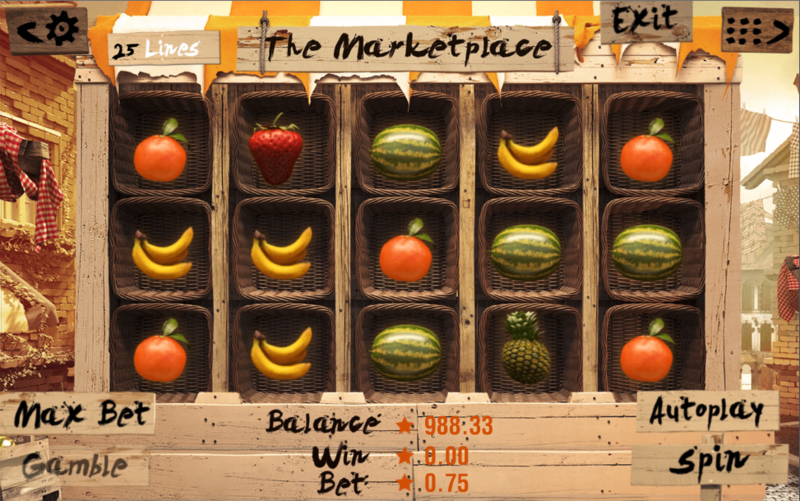 The Marketplace really shows off the HD qualities with fruit which looks extremely realistic; this game is well worth checking out with the free spins and the addition of the gamble feature.